Even though Andre Ethier has proven that he can hit for power, contact, and in the clutch many fantasy baseball owners don’t pay serious consideration when it comes to drafting Andre. Why? Well he shares and outfield with Manny who will always be Manny and Matt Kemp who has become a superstar since he started dating singer, Rihanna. Yet, Andre is the best player out of those three. Andre Ethier is one of the rare types of players I call a “six tool” player. Andre is fast, has a good arm, is a great fielder, can it for power and contact, and can hit in the clutch. When players hit in the clutch that generally means they will get a few extra home runs and or RBIs. Fantasy wise though you get a .290 average, 100 runs, 100 RBIs, 30-35 home runs, 5-7 stolen bases, and an OBP of .375 ish. With Andre you will not get the number of stolen bases other guys could probably get with his speed because he is not the best base stealer. However, just like Ellsbury, Andre can still turn a double into a single any day of the week. Andre is one of the safest bets out there. His numbers have all gone up with the exception of OBP and SLG, since his rookie year. Matt Kemp is a little bit riskier as some analysts think he might let the fame go to his head. Manny, well . . . he is probably one of the most risky outfielders to draft. However, Manny is a high risk- high reward type player. When it comes to Nelson Cruz, Josh Hamilton, and Hunter Pence (who will be talked about in a little) all three are very risky. All three of them need to prove they are not “one year wonders,” and Hamilton, so far has not done the best job with that. Ok so you might not be so sold yet on Andre. Well are you sold on Nelson Cruz, Josh Hamilton, or Hunter Pence? Ok you probably aren’t but just pretend you are. Andre Ethier is A LOT better then them. While Cruz and Pence are five tool players just like Ethier is classified as, Hamilton is not the fastest guy but has more pop in his bat obviously meaning he is not a five tool player. I mean, the stats prove that Ethier is obviously better then Cruz, Hamilton, and Pence but because Hamilton, Cruz, and Pence are more well know Ethier will most likely get overlooked for the third straight year. But there is not way he should I mean, just look at what MLB predicts the stats for Either, Cruz, Hamilton, and Pence will look like. So actually Ethier is tied with Cruz followed by Pence. But when you compare only Ethier’s and Cruz’s projected stats Ethier is the winner. Ethier wins four categories plus the tie in OPS while Cruz wins three plus the tie in OPS. Another thing to take not of is that most leagues do not use OBP, SLG, or OPS. Meaning that Ethier would win three categories to two if you don’t factor in OBP, SLG, or OPS. Andre will not be in your draft in the seventh round so I would plan on trying to get him with a late fourth pick to a late sixth round pick. I would tell you my plans to get him but well, I do not want anyone knowing my plans this year. Ethier is a safe bet who has no injury history and will get more pitches to hit with Manny and Matt Kemp on a balanced team who will most likely win the National League West again. I must say I had the Dodgers winning this one. The Phillies did exactly what they needed to to win this series, that was to shut Manny down and hit the LA pitchers. Kershaw got hit, Kuroda got hit, Broxton got hit, and that is all they needed to win. However the Phillies pitching was outstanding. Cliff Lee was a force. Lidge closed out the ninth. Hamels got the job done. Blanton did okay. Even Pedro joined in with the fun. This whole series came down to pitching. Even though guys like Ryan Howard, Jaso Werth, Jimmy Rollins, Raul Ibanez, and Pedro Feliez hit the you know what out of the ball. Ryan Howard also ended up winning NLCS MVP. For me the turning point for this series was game three when the Philllies won 11 to nothing against starter Hiroki Kuroda. Kuroda pitched 1.1 innings in which he gave up six hits, six runs (all earned),struck out one, and gave up one home run. Why did the Dodgers lose that game? Not because of Kuroda but because of this man . . .
Yep Joe Torre is the reason they lost that series. Torre decided to start Kuroda over all-star Chad Billingsley. Billingsley pitched out of the bullpen that game but he did not do so hot either. In 3.1 innings he gave up two hits, two earned runs, and two walks. However, Billingsley did give up no home runs and struck out three. In Billingsley’s case you have to give the man some credit because he did not go through the normal routine that a starter would go through. I think if Billingsley did go through his regular routine and started he would have pitched 6.2 innings giving up 2 runs, six hits, two walks, five strikeouts, and one home run. In all fairness though the Dodgers got killed by Cliff Lee who gave up no runs , and just three hits, along with no walks while striking out ten. So it is not entirely Torre’s or Kuroda’s fault. But lets talk abut those Dodger bats for a second. The Dodgers got out scored 35 to 16. 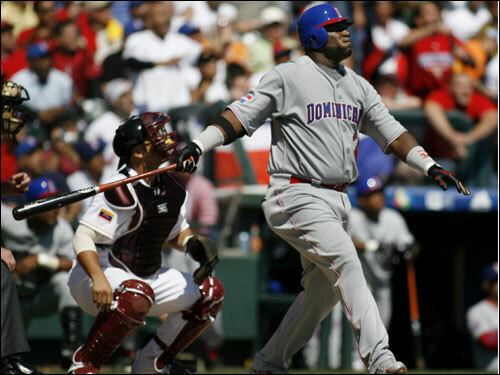 Manny Ramirez batted .263 with five hits, three runs, two RBIs, one home run, and an OBP of .300. I think it is fair to say that Manny got shutdown this series. Another guy the Phillies kept under control was Matt Kemp who batted .250 with five hits, one home run, just two RBIs, and an OBP of .286 in twenty at bats. Kemp to me at times has either been underrated or overrated. I believe this whole playoffs he has been overrated. However on Dodger’s outfielder who did pretty good was Andre Ethier. Ethier hit .263 with five hits, one home run, three RBIs, two runs, two walks, and an OBP of .333 in nineteen at bats. Ethier was the most clutch hitter in baseball however he did not always get the job done. He did though get the walk which gave the Dodgers I believe the lead in game two. The Phillies did not win the World Series the Dodgers lost it. 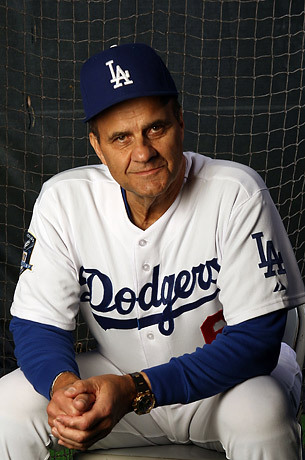 Joe Torre did a terrible job managing this series. I know you need to take risks sometimes but Torre might need to learn about a new thing, common since. I don’t care if Ronnie Belliard had a hot bat. Orlando Hudson is the better option every day. Having a starter pitch out of the bullpen is a mistake unless they are young and have had pitched out of the pen in say the last four years. Otherwise it messes up all kinds of stuff. cough*cough*Chad Billingsley*cough*cough. If it was not for Torre’s elite stats I would fire him. No joke. If this was Manny Acta or Bob Melvin or Cecil Cooper he would be fired by me. Maybe that is why I am not going to be a general manager or owner though. Yet Torre would have a great replacement in his bench coach, Don Mattingly who should have been manager in New York after Torre left. Mattingly is not one of my favorite players as he was a long time Yankee but I believe he would be an amazing manager and I am surprised he did not talk with the Astros or Indians. though makes one of two points. One, that he likes LA a lot and does not want to leave. Or two, he needs more ‘training from Torre’. I think it is number one yet I think number two might come into play a little bit. I think though we also have to mention that this was the second time in two years that these teams have faced off in the NLCS. Yet the Dodgers never had to face Raul Ibanez or Cliff Lee. The Phillies though never faced nearly half of the Dodger bullpen, Orlando Hudson, Ronnie Belliard, Randy Wolf, and Vicente Padilla among other guys in 2008. The Dodgers had NO excuse to lose to the Phillies. Yet, they did. But now lets look at what the Phillies did. The Phillies won. The Dodgers had home field advantage and the Phillies won. The Dodgers had an all-star closer and the Phillies won. The Dodgers had the best clutch player in baseball and the Phillies won. The Dodgers had four five tool players (Kemp, Ethier, Martin, Hudson) and the Phillies won. The Dodgers had a manager with four World Series rings and the Phillies won. The Dodgers were a better team and the Phillies . . . won. Anyway if the Phillies win the World Series the Dodgers should not be upset. Then they would have lost to the championship. However it seems one Dodger executive was not so happy as Dodger owner, Frank McCourt fired his wife from CEO of the team. However the twist that most people do not know is that they are divorcing. So it is a little different. At first when I heard about this I thought, wow and laughed a little. It was not till writing this article that I learned that they were getting a divorce. I really think this was just a way to get his anger out about LA but he claims it was just business. Again though maybe that is why I won’t be an executive. First off I am sorry I have not been blogging lately. This whole week I have had drama practice along with a baseball game on Tuesday and on Thursday I had my drama show. In case you were wondering we did Peter Pan and I was John, the kid with the glasses. Friday I went to the Astros game because my godmother’s husband is the announcer for the San Diego Padres. Sunday I will get to go up into the booth and I will show you pictures of both games. Wow lots of steroid news lately. Ugh . . . Can we just ban steroids from the USA or something. Well I guess that would not even work because the Blue Jays are in Canada and many players come from outside of the USA. But until someone solves this problem you will be seeing posts like these. Manny, Manny, Manny. Wow, I really did not expect this. I mean I usually say my least favorite players (A-Rod, Jeter, etc.) took steroids but most of the time I joke around about that stuff. Well when the news about A-Rod happened then I would joke around that I was right. However I never would have thought Manny would have done this. Believe it or not I fell sorry for Manny. Even though Manny did do something illegal he should not be suspended for 50 games. He did not do HGH or something like that. It is pretty strange what he took but he did not make him self stronger with the drug. If I was Bud Selig I would have suspended him for 30 games. I know rules are rules but they need to make it so if you take illegal substances besides steroids suspended you for 30 games and HGH and other steroids suspended you for 50 games. Believe it or not Manny is still one of my favorite players. I have never been mad at him just very . . . very irritated. I do not believe in all that junk people said about Manny and why he left Boston. If it was not for Manny the Red Sox would not have won the 2004 World Series and maybe not the 2007 World Series. Sure he was a terrible fielder but up until the end he was a good person in the clubhouse. The one problem is the facts are not all right. Just read what Manny had to say. Why did the doctor not know that it was banned. Was the doctor a Padres, Giant, or Angel fan? Just kidding If he did know about that and he was a fan of another team well can I just say jerk! If When I play in the MLB I am going to ask if this medicine or whatever is legal before I eat it or whatever. The Dodgers should somewhat be thankful. What if MLB suspended Manny in September. Then LA would lost him for the postseason. Every one said who ever got Manny would win the west well I think it nows relies on another Dodger. More on him in the next few days though. But whoever guess correct will get a prize. Manny will come back sometime around July third which is better then October third. Now one of the big questions that pops up is how will this effect his Hall of Fame voting. This one is very, very hard. He did not use HGH but many Hall of Fame voters want to be consistent. If they did not vote for McGwire they will probably not vote for Bonds or Clemens. However I would vote for Manny if I could vote. It might take longer then say Ted Williams but I think it will take him six to nine years for him to get in. The problem is though I wonder how kids fell. No I do not mean me I mean little kids in say first grade. The probably do not understand all of the steroid stuff. So what do the parents say to them. Do they tell them Manny got hurt or do they say he took HGH and not the real stuff he took. I do not know since well I am not a parent but if you are I would like to know what you would say if your kid was around seven. The problem is though Manny just added to the list of Red Sox juicers. Now I doubt he took them with Boston but what about Roger Clemens and many say Mo Vaughn took steroids. A few people at school say Big Papi took steroids and one person told me Jon Lester took legal steroids when recovering from cancer. I could care less about Lester taking steroids because if he did they where legal. Now maybe I am just over reacting but maybe I should be worried. I mean the Yankees only player I can think of that took steroids was A-Rod. Speaking of A-Rod what was that !!!!!!!!!!!!!!!!!!!!!!!!!!!!!!!!!!!!!!!!!!!!!!!!!!!!!!!!!!!!!!!!!!!!!!!!!!!!!!!!!!!!!! Why did he have to do that! What about karma! Was being out for the season it! I do not care if he hits home runs but on his first at bat! I would have loved him to strike out. I mean kids know he took steroids. I some ways he is “telling” kids that steroids make you hit home runs. They somewhat do but think of all the bad things they do. It is gross and disturbing. I do not want to go to much into A-Rod because that really is old news but before I go I would like to send my thoughts and prayers to the families of Dom DiMaggio and former Detroit Piston’s coach Chuck Daly. And I Thought The Yankees Were Stupid and Greedy! 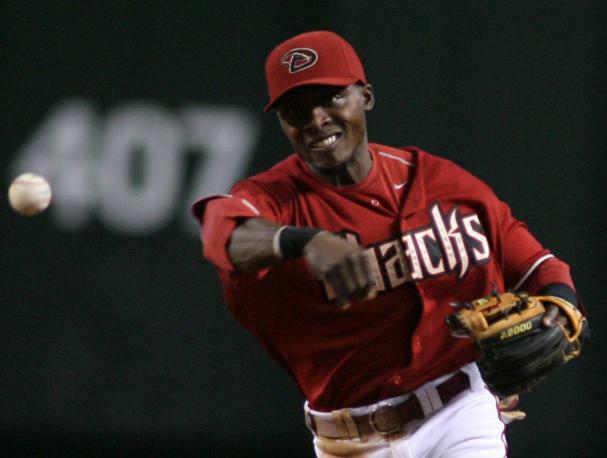 The Dodgers signed second baseman Orlando Hudson to a one year, $3.38 million dollar contract pending a physical. If Hudson reaches all of incentives he could get an extra $4.6 million. In High School he was a three sport standout in baseball, basketball, and football. Hudson attended the Spartanburgh Methodist college where he played baseball. He was drafted by the Toronto Blue Jays in the 43 round in 1997. He made his major league debut on July 24, 2002. 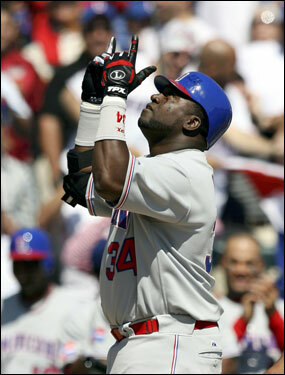 He played with the Blue Jays till 2005 when Hudson won his first of three Golden Gloves. 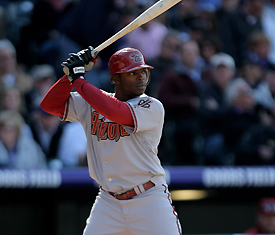 In the 2005 offseason Hudson was traded to the Arizona Diamondbacks for pitcher Miguel Batista, third basemen Troy Glaus, and prospect Sergio Santos. 2005 was Hudson’s best year. He set a carer high in batting average with a .287 batting average. He also set carer highs in home runs with 15, RBI’s with 67, runs with 87, games with 157, at bats with 579, hits with 166, doubles with 34, triples with nine, total bases with 263, walks with 66, stolen bases, on base percentage with .354, and slugging percentage with .454. All of them are still carer highs except for walks, stolen bases, and on base percentage. He never got any MVP votes that year though as Ryan Howard won it. Hudson became the sixth infielder to win a Golden Glove in both leagues on November 3, 2006. In 2007 he made his first all-star game. He had a walk and a strikeout. That year the Diamondbacks made the playoffs but Hudson didn’t play a single game and as of today has never had an at-bat in the postseason. Later that year the “O-Dog” won yet another Golden Glove stretching his streak to three consecutive Golden Gloves at shortstop. 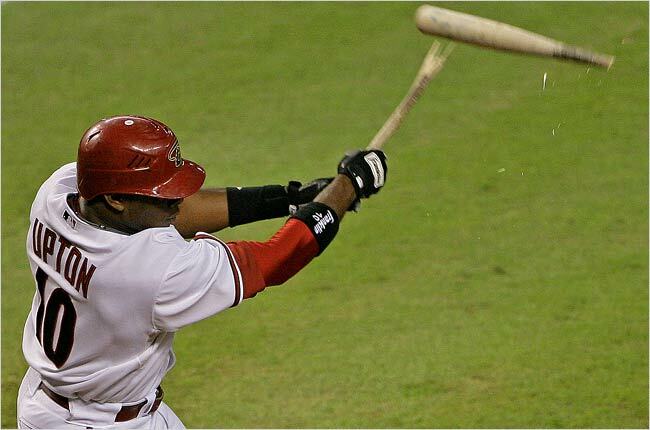 In 2008 Hudson missed about fifty games due to a dislocated left wrist. Due to the injury he did not win a Golden Glove and lost out to Brandon Phillips of the Reds. This deal means a couple of things first he will have big holes to fill. Hudson is replacing future hall of famer Jeff Kent who retired this offseason. Kent has hit the most home runs in baseball by any second basemen. Second, Manny Ramirez is less likely to sign with the Dodgers and Manny Ramirez will get a lot less then he wants. The Dodgers just spent three million on a with a great glove. The Dodgers don’t need Manny and the Hudson deal sends that message to him. Third, the Dodgers are greedy. This signing was a total waste of money the Dodgers already have a great second baseman in Blake DeWitt aka the future Dustin Pedroia. This deal really hurts the development of him and this could be bad for DeWitt and the Dodgers. 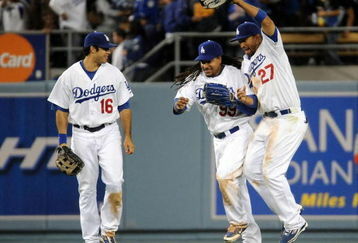 The also already have three good outfielders in Juan Pierre, Matt Kemp, and rising star Andre Ethier. Why need Manny? Sure he is a force in the lineup but having Pierre a guy who could start on most teams in stupid. Lastly the most obvious one Blake DeWitt is the new utility infielder. So having Mark Loretta was not enough for a utility guy? At least they have depth. Now before I end I want to say I am fine having Hudson start over a older guy but not a rising prospect. So now when I say stupid Dodgers I really mean it and I don’t care that the Dodgers are my third favorite team they are greedy, stupid, and idiots for wanting Manny. Hey I just thought of something. Manny Ramirez is greedy, the Dodgers are greedy, and Scott Boras is greedy obviously greedy does not work with greedy. Maybe That is why Manny is taking so long. Before I start I must say a few things, I never said that Adam Dunn would make the Hall of Fame. I said if he wants to make the Hall of Fame he must cut down on his strikeouts. Thanks Mark for putting me on the front of MLBlogs! Now I don’t feel like blogging about A-Rod so enjoy Tiny Tim. Tim Lincecum is 24 years old. Lincecum attended Washington State. 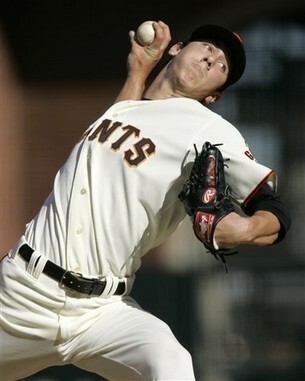 Lincecum was drafted in the 48th round by the Chicago Cubs. He was the 1,408th pick in the draft. He decided to go to college and was drafted by the Cleveland Indians in the 42nd round, 1,261 overall. He has a carer record of twenty-five and ten with an ERA of 3.16, 415 strikeouts in just two major league seasons. He has never made an error at pitcher but has never won a Golden Glove. In 2006 he won the Golden Spikes Award. In 2007 he went seven and five with an ERA of 4.00 and 150 strikeouts in 24 games. 2008 was the first year he made the all-star game. He did not pitch in the game due to the flu. That season he won the National League Cy Young Award winning 18 games for a team that won just 72. He also lead the majors in strikeouts with 265 and had an ERA of 2.62. Lincecum has yet to pitch in the postseason but some people think the Giants could win the N.L. West. I think the D-Backs will with the Dodgers coming in at second by one or two games. All that could change if the Dodgers got Manny Ramirez though. Even though Tim has only been in the league for two seasons his nicknames consist of The Franchise, The Freak, and Tiny Tim. When Tim was a kid he told his dad he was a freak because he was so good. He got dubbed Tiny Tim for being only 5’11” and weighing only 170 pounds. 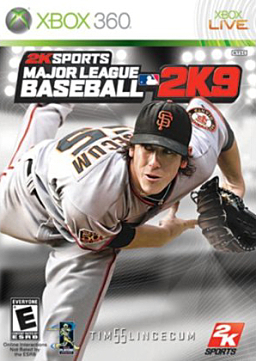 The same day Lincecum won the Cy Young award he became cover athlete for MLB 2K9 replacing Jose Reyes. Lincecum is the first pitcher to be on the cover of the game. 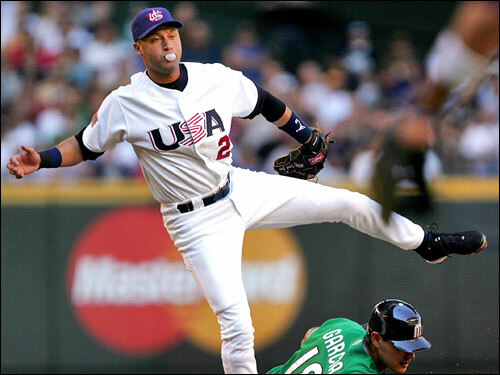 Derek Jeter was on it in 2005 and 2006. One thing is for sure his wind up is pretty weird, funny, cool, and interesting.